Life is a series of moments. Things waiting to be discovered and experienced. Heightened hours to enjoy to the full and times of dark trial, trouble and tribulation. We’re on a journey where we find ourselves along the way. And a veritable trail of wonder, hopefully. Though I usually attempt to freeze-frame wonder moments in a camera lens, God often whispers for me to desist, slow down and simply savour what I see. It’s as if those wondrous clouds, that scenic sky, floral beauty and trellis of trees were made just for me. And in a way, they are. Because Jesus would have willingly gone to the cross if there had been only one of us in need of a Saviour. God spills out creation’s beauty as though it’s tailor-made for you and me. I’m a woman on a mission, without leaving home. A soul on a quest to pursue beauty and seek wonder in the commonplace, as I look to discover God in the minutiae of my days. He is here. The Holy One, King of heaven and earth , inhabits the ordinary. He’s longing to be found by questing minds and hearts. Is it easy? Not always. It takes determination and dedication to keep pressing in to sense the sacred in the secular. Is it worth it? Oh, yes! 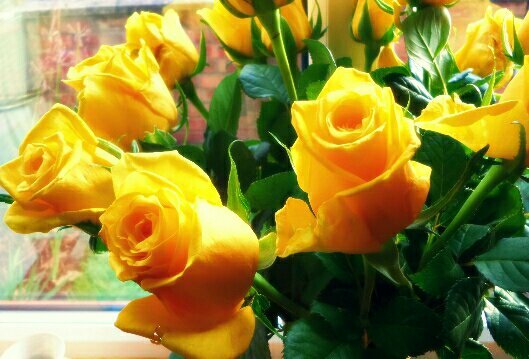 Sometimes our eyes need things enhanced or altered a little, as in the arty style photo of yellow roses below. They are enchanting in their own right, of course, though we can become jaded by the familiar and satiated with sameness. A little tweak from us (or a wake up call from God) is enough to awaken our hearts anew to the beauty of this moment, being present to His presence. 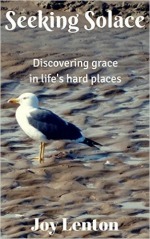 “It takes determination and dedication to keep pressing in to sense the sacred in the secular. Is it worth it? Oh, yes!” Just the reminder I need at the start of my day, Joy. Thank you! Thank you for your encouragement here, Joy. So true – He’s in each and every moment. Even in my “shrouded, clouded, muddled mind” this week. So thankful He gives us those “wake up calls”. I so recognize what you shared about Him slowing you to take in the moment, rather than snap a photo of it: He’s done the same with me. It must be so very hard being house-bound. That you have so much encouragement to share says so much about the presence of Jesus in you and your yearning to go ever deeper with Him. Thank you for all you’ve been sharing these past few weeks. You’ve been such a blessing to me. Living like we believe this truth, God is present in the ordinary, is a great gift. Thank you for these words today, friend! This is my prayer right now. We have some things to discuss with our son and another 21 yr. old who lives with us. But God is giving wisdom and we are working things out. Hi Joy! I really like the line about being on a mission, without leaving home. That’s so rich, thank you for those words. So many times we think we have to run out and do something ‘big’ in the world. When that doesn’t work out, does that mean that I’m worthless? Certainly not!